Successfully Added Night Vision Monocular - Built-in Camera, 6x Zoom, 720M Range, 1.3MP CCD Sensor, 16GB Micro SD Slot to your Shopping Cart. 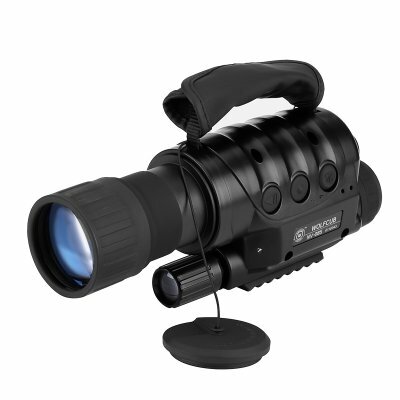 This is a high-quality digital night vision monocular that features a compact and lightweight design. With its lens that can be adjusted in between -4 and 4 diopter this night vision scope is guaranteed to deliver a clear image no matter your eyesight. With a 2048 x 1536 resolution, it provides a clear view and stunning detail during both day and night. Whether you’re using it for your outdoor activities, nature observation, or property security, this night vision monocle is assured to give you a clear and detailed view no matter the time of the day. Coming with its own little carry case this digital night vision scope is extremely portable and can efficiently be carried around no matter where you’re headed. A padded and adjustable hand strap makes this monocular comfortable to hold no matter the size or shape of your hand. Additionally, this digital monocular features a 1.4 inch thread at its base, allowing you to mount it on a tripod in order to record clearer and more stable footage. Featuring a built-in IR illuminator that automatically switches on and off this night vision monocular boasts a 6x digital zoom through which it has an impressive visibility range up to 720 meters. Along with its highly sensitive Sony CCD sensor and the latest digital software this night vision camera is capable of providing you with a detailed black and white image of what ever lays in front of you, even when located in the darkest corners of the world. Its energy efficient IR illumination design lets you record after dark while using the least possible amount of energy – allowing you to record and observe for hours in a row without the need to worry about battery life. This monocular features a weather proof design making it possible to head out into the night no matter the weather conditions. This electronic gadget comes at a remarkably low price and offers you the perfect way to explore the neighborhood and observe all that Mother Nature has to offer during the night. This night vision comes with a 12 months warranty, brought to you by the leader in electronic devices as well as wholesale electronic gadgets..
Arabic: - الرؤية الليلية أحادي - Chinese Simplified: - 单目夜视镜 - Czech: - Monokulární noční vidění - Dutch: - Monoculaire visie van de nacht - French: - Monoculaire de Vision nocturne - German: - Monokulare Nachtsichtgeräte - Hebrew: - ראיית לילה Monocular - Hindi: - एक रात दृष्टि - Hungarian: - Éjjellátó monokulár - Italian: - Visione notturna monoculare - Japanese: - ナイト ビジョン単眼 - Korean: - 야간 투 시경 단 안 - Malay: - Night Vision Monocular - Norwegian Bokmål: - Nattsyn Monocular - Romanian: - Night Vision Monocular - Russian: - Монокуляр ночного видения - Spanish: - Monocular de visión nocturna - Thai: - ปกติกล้องคืนวิสัยทัศน์ - Turkish: - Tek tüplü monoküler gece görüş gözlüğü - Vietnamese: - Đêm tầm nhìn.